And that’s how I will complete learning to make home-made chocolate from scratch with cocoa beans. By abandoning it. Thank you Arriana. Its the season for many things. Rain, tomatoes and transition. Summer to Autumn, wet to wetter. Transitions can be hard but I want to see them as twilight periods, the coming of easier times, even if the current state of being doesn’t indicate it. Hang in there. Keep the hope. Autumn with its golden lights shall come. If it is summer you await, hang in there some more and embrace half-heartedly or fully the warmth of autumn, the bite of winter’s frost and the awakening of life in spring. And then your summer shall ‘magically’ appear. Even though I love seasons, I like to enjoy their ‘permanence’. Temporal as it is. Contradictions in terms I know. When it rains in August, it really rains. There’s little room for sunshine and games. I don’t enjoy the rainy days as much as I do the nights, when I don’t have to turn on the air-conditioner or the creaking fan. I can sleep to the sounds of darkness – the hoots and the calls. Yes, seasons are a good thing. Here, it is the season for tomatoes. And there too, right? Where you are. I think tomatoes are everywhere. When its tomato season, and I have space in my deep freezer, I buy them by the basket. Yes, basket. But not the sort you think, not some small, woven container……I’m talking huge, the size of a tub. Full of red, just harvested tomatoes from vines in the north. I’ve never seen tomatoes sold this way anywhere in the world. Yes I know I haven’t been far but still. We eat a lot of stew – around the country, in different formats but stew is as common as anything, so yes, we love our tomatoes. Toe ma toes. Or toe may toes. It doesn’t matter how you say it. We all know what we mean. This is the season of sweet juicy oranges. Praise God. Oranges that taste of more than ‘water’. That taste like oranges should. Its the season of cocoa. As in the cocoa fruit, pod small like a little rugby ball. 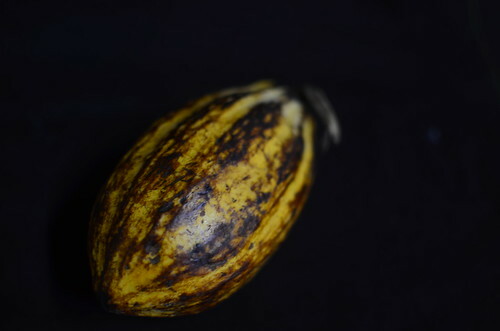 Yellow, ribbed, hard shelled and ready to be broken open, to reveal the source of ‘magic’ which we get to know much later and call chocolate. 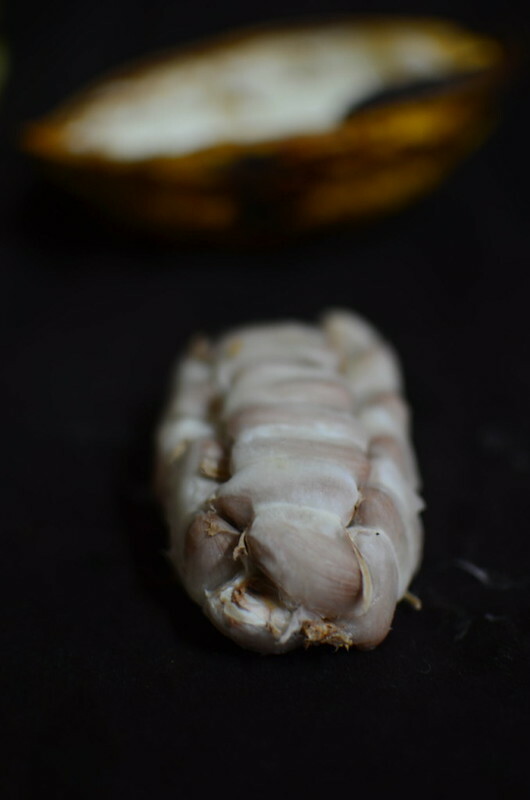 I break open the pods and call the children to come have a taste of the white seeds held together in the centre by fibrous threads. 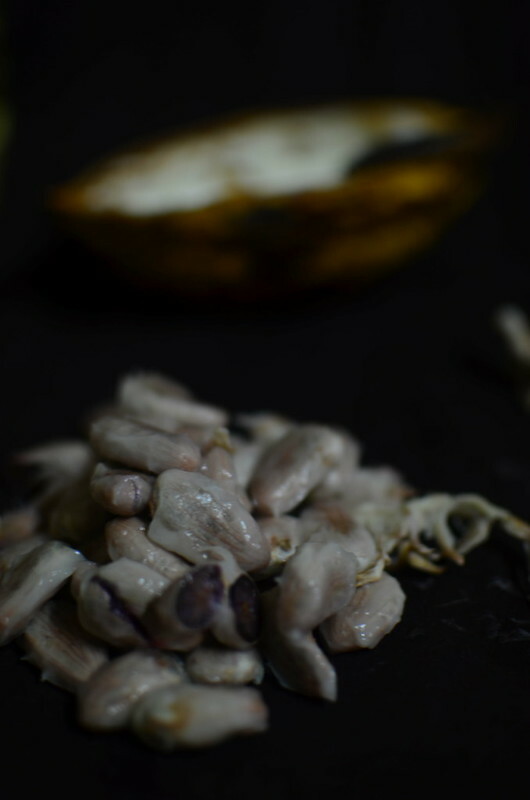 The seeds beans come apart easily, soft and slippery – covered with sweet pulp that smells like young bananas and tastes like soursop. Creamy, with a slightly sour edge, lickable like a lozenge. 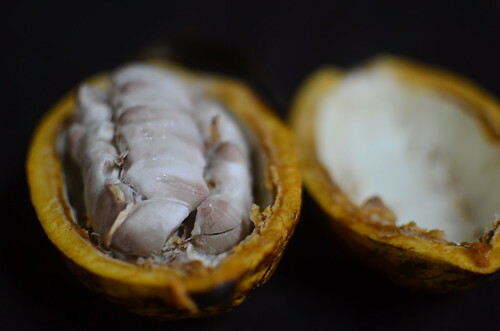 A Brief History of Cocoa on Medicine Hunter: Even as chocolate was stimulating invention and industry in Europe, cacao trees were springing up in every tropical location. 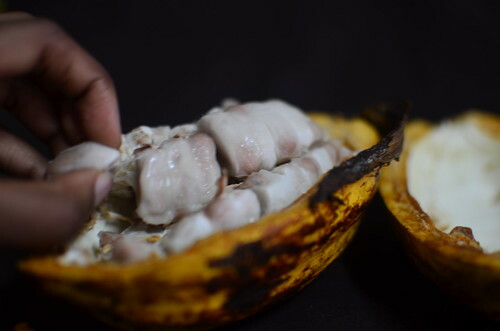 The Portuguese planted cacao in Sao Tome’ and fernando Po, in Africa. The plantations would spread on that continent to the Gold Coast, Nigeria and the Ivory Coast. They try it, excited that it’ll soon be time to make their homemade chocolate. Not one of them likes it, so I’m left alone to sit and lick the beans clean. Cocoa, like groundnuts used to be more prominent in Nigeria’s past. Like it is in Ghana’s present. But I’m not terribly bothered, especially since excellent Nigerian chocolate is still available and the Cocoa Research Institute of Nigeria (CRIN) is very active, and has been since 1964. Update August 12, 2013: According to The Blueprint Newspaper, online, The FG (Federal Government of Nigeria) has kicked off a training program of 70,000 cocoa farmers and 100 organisations, as part of a Cocoa Agricultural Transformation Agenda (CATA) project. Once the pulp is licked off, the beans are almost ‘threadbare’. They’re soft, and one could very well proceed to chew the entire bean. This time you’ll be met with bitter. Purple, bitter ‘nibs that as yet sport a vibrant, almost royal colour but with the characteristic bitterness that cocoa nibs are known for. And that’s where I end my cocoa bean journey. I don’t venture further to chocolate city, because I don’t have the tools I require to get industry quality chocolate. Further which begins with fermentation and drying of the beans for up to 2 weeks, after which they are roasted. Like coffee beans – to develop flavour. Then the thin shells, covering the nibs are removed in a ‘cracking and winnowing’ process. Finally, the nibs are refined – grinding, blending and getting them to a state where the end result gives a smooth mouthfeel. This creates a cocoa liquid, which has to be conched to remove a lot of the acidity. Finally, the result is tempered, and combined with other ingredients to yield various grades and types of chocolate. Once you’re done, you can say you’ve made chocolate from scratch. I don’t recall seeing cocoa trees, but apparently, they resemble English Apple trees. Two years ago, this fruit ‘drove’ me mad. Literally. I ‘discovered’ it on my return home to Nigeria in 2011….and knew its name in every language but English ‘proper’. I first spotted it – dirty brown mounds on yellow enamel trays, lined with deep blue rims and artfully balanced on heads. I called my sister and asked her if she knew the name and she said ‘Epapa’. Which was a good trigger but not the answer I wanted. This prompted a call to the ends of the earth, from Food52 to Denmark and Nigeria. I’m slowly going mad back at home in Nigeria where I’ve discovered a ‘new’ fruit which has only local names….but no ‘common denominator’ English name. Its funny looking fruit with thin dark brown, sandy skin which can be peeled off to reveal ‘smooth, marble-like’ crisp orange flesh. 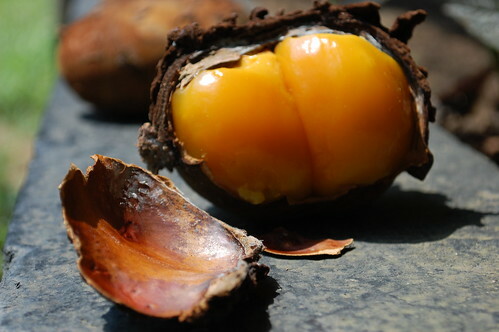 Once skinned, it resembles a persimmon. 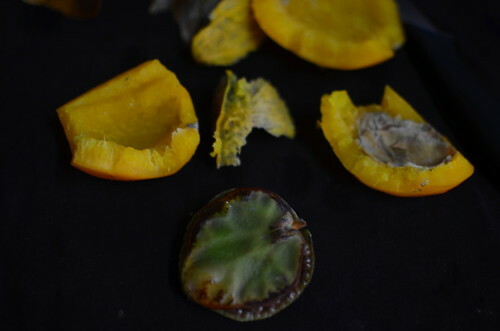 Once cut open, there is a heart-shaped seed which is removed – one bite reveals a crunch which tastes like a weird fusion of carrots and fresh peas! Help! Finally, my friend E of Comme un Chef dug out the botanical name – Cola Lepidota, and my torture came to an end. Monkey Kola is a common name given to certain wild Cola spp relatives of the subregions. They include the Cola pachycarpa K.Schum (White Monkey kola), C. lateritia K.Schum (Red Monkey kola) and C. lepidota K.Schum (Yellow Monkey kola). All these yield edible fruits of varying characteristics and sweetness. 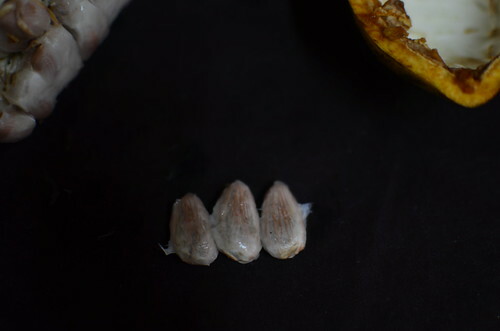 The species are known in southern Nigeria, where they are common sights in local markets during the peak fruiting season by June to November. 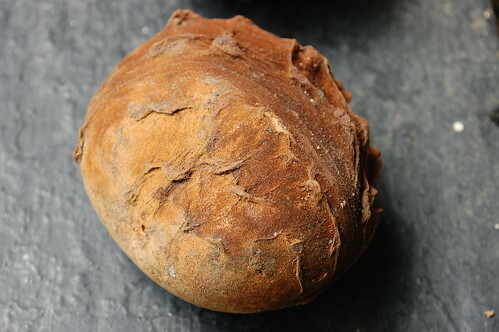 Monkey Kola is an interesting gem of a fruit – polished, hard as marble and bright orange. 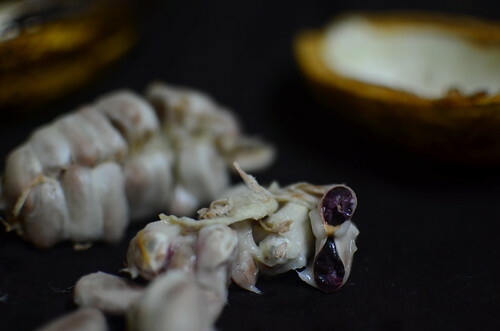 Its housed in a dusty, velvety skin that ranges from smooth to tentacled. The skin is thin, and soft, almost downy. The seeds which resemble bean pods mostly are about 6 – 8 cm long and 4 – 6 cm wide. They sport seams running right round, which are the gateway – to the diamonds in the rough. 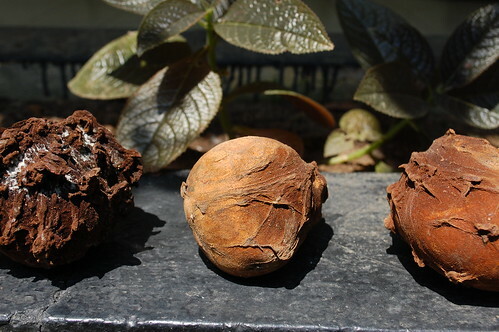 Some seeds are twinned inside, and one perspective very much resembles bum cheeks. Like peaches. And nectarines. When the fruit is fresh and good, its hard and crunchy (left of photo below); and when it’s heading south – it soft and squishy. It disintegrates in seconds (right, of photo below). I love the clean flavours of the crunch fruit – quite vegetal. Sweetness and crunch of carrots. Yet with a lighter flavour than their orange coloured friends. 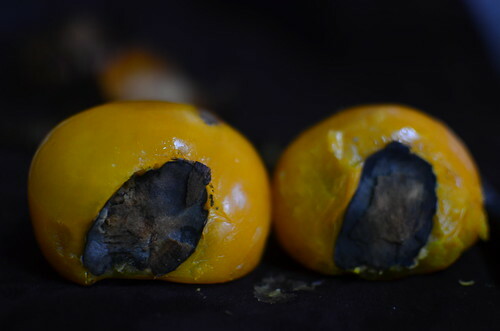 Read more about this fruit and my experimentation in ‘My Favourite Things: Nigeria and Beyond, from 2011. And about the Australian fruit called Achacha which isn’t the same thing as Achicha. I was thankful for the introduction though…..via Jen who left a comment in the post. I almost didn’t make writing this. It has been weeks in the making but life’s been going on, with much intensity. Things will get back to normal soon. This season too shall pass, and I’ll embrace a new one. Perhaps I’ll bring you the tomato stories then, and tales of September and October fruit. Knowing what you now do of this fruit, Achicha, any suggestions on what to do with it? I know, I know, not that I have to do anything with it but…..you know, its worth a try!